Mischief, I tell you, mischief. The Doctor’s Daughter is nothing more than an exercise in audience manipulation. Since the title of the episode was announced many of us have been getting our knickers in a twist over the how, why and wherefore of said relative's relationship to the Doctor. Extravagant theories about her being Susan’s mother through to aliens extracting DNA from the bubbling hand have littered cyberspace over the last few weeks. Much hand-wringing later, about whether this really would be the canon buster it threatened to be, and writer Greenhorn cheekily, but timidly, avoids this can of worms even before the titles start to roll. I don’t know whether to applaud him and Rusty for their flippancy or whether to damn them both for climbing down from actually dealing with such a potentially divisive idea. It’s certainly a naughty con calculated to extract the maximum response from an audience without actually putting in the necessary graft to achieve it. And if you are going to pull a trick like this then you'd better have something magnificent waiting in the wings to satisfy audience expectation. Jenny Who emerges from a giant photocopier, swathed in dry ice, fully clothed, with immaculate make up, and one half of fandom sighs with relief that she’s only a ‘clone’ after all, whilst the other half smashes its television sets in a fit of peak because Susan doesn't get a look in and the idea is simply a moribund conceit adorned with a very big set of inverted commas. I have to admit that I’m teetering into the latter camp and, as any fully paid up ming-mong secretly wishes, had hoped that Greenhorn would go all out and twist the received wisdom of the series out of shape, as far as the Doctor’s family is concerned, and give us something genuinely surprising to get our teeth into. The only surprise, and disappointment for me, is that he didn’t. In the end, he simply road-tested that other canon-strangling concept – the female Doctor – but could only manage to set that up that with a series of rather predictable plot turns and the words ‘spin off series’ or ‘Jenny Who will return to CBBC’ written all over them. Post titles, post missed opportunity then, the tendency here would be to disinherit Jenny as just another feisty, blonde, Buffy-esque poppet who sommersaults Mission Impossible style through laser beams, and on the surface you could be forgiven for easily assuming that position. However, Georgia Moffett’s rather likeable performance, full of naive charm, does make much out of, what appears to be, a pretty thankless task on paper. The obvious problem here is that there simply isn’t enough time to develop Jenny’s character and I felt that, despite best efforts, I didn’t know or care about her well enough to justify blubbing over the cynical and manipulative inevitability of her ‘death’. As soon as there is mention of her joining the TARDIS crew you know full well that she’s a marked woman and will serve out the rest of the episode with an early death accompanied with much, equally inevitable, wailing and gnashing of teeth from the Doctor. But this episode also wants to have its cake and eat it and thus the double cheat then comes with her post-death Wrath Of Khan revival (‘Hello boys’ she purrs, in a way that would befit a bra commercial), and her strapping herself, butchly, into a spaceship and careering (in indeed as a ‘career’) off into space as the embodiment of the female Doctor concept that’s been gnawing away at the balls of the series since John Nathan-Turner’s own bit of bluffing in the early 1980s. Like father, like parthenogenic offspring, then. God, it’s that obvious even her bloody spaceship has roundels on the walls. What saves this from being the disowned child that it rightly deserves to be are the three central performances from Tennant, Tate and Agyeman that make up the filling in this predictable sandwich. 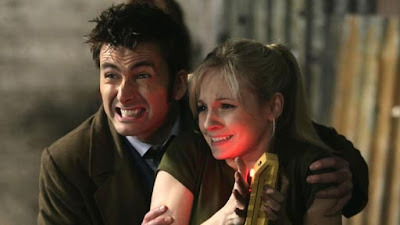 Tennant is actually given an opportunity to offer a decent performance, seemingly going through the emotions rather than just the motions, even though it is by default of Jenny’s existence in the episode, and he’s truly great in his scenes with Tate mournfully discussing the Time War and the loss of his family. He’s tender and hurting, in a rare glimpse into the Doctor’s inner turmoil, and he makes a virtue out of the Doctor and Jenny’s innocence and experience parable. Tate is also the perfect foil, with Donna questioning the Doctor’s denial of his offspring, and she manages to get him to see that he truly is a reflection of Jenny, that he should be an example to her of his morals and beliefs, that he is, and she potentially could be, both pacifist and warrior. An utterly contrived riff on Pinocchio, of course, with Tennant as Geppeto, Tate as Jiminy Cricket and Moffett as said poppet/puppet but at least it's redeemed by the good performances and characterisation. Meanwhile, by separating Martha from the central plot, and using her as parallel variation on the theme of being the Doctor, as well as a Doctor, complete with Hath companion, the episode at least gets to the point about why Martha has given up traveling with the Doctor. She can’t stand the pain anymore judging by the primal screams she utters as her Hath buddy drowns on the desolate surface of the planet. Agyeman at last gets to demonstrate why she’s been brought back to the series and delivers a raw, emotional performance which more than makes up for the disappointment of the last two weeks. Yet, I still don’t understand why a gilled, fish creature would actually drown but it is perhaps better to let it serve the emotional power of the scene rather than suggest it be a slave to logic. Again, the episode looks good even if it clearly hasn’t had the biggest budget of the series with the surface of Messaline deftly sketched in with some moody looking CGI as the icing on the cake. There is a lot of running around in corridors but then the script charmingly takes a witty pot shot at this aspect of the series’ limitations anyway. The supporting players are rather bland and forgettable and why is the usually marvellous Nigel Terry playing Cobb with a Devonshire accent? He seems to think he’s still in Excalibur by the sound of it. Strangely, it is very distracting and undermines Cobb's gravitas as a character. Joe Dempsie does his best with the character of Cline but I’ve no sympathy for anyone who falls for the ‘seduction of the guard’ cliché. The Hath are interesting creatures, eventually portrayed as victims rather than out and out monsters, but the prosthetics aren't as convincing as they should be and there is little time to explore their origins or motivations. Despite the prick-teasing of the episode title and Moffett’s charms, and whilst the rolling plot is gathering no moss, there is a discussion nagging on at the edges of the episode about fundamentalist creationism versus evolutionary science where the Source, a piece of hi-tech terraforming equipment, has become a mythical God like symbol, and where possession of it has, to both the humans and the Hath, become just an opportunity to prove that might is right. The Doctor, as a literal father figure, in probably the best scene in the episode, underlines his, and the series own moral stance, in the ‘I never would’ remonstration with Cobb. The development of Jenny and the interesting debate about the potential costs of the Doctor being both warrior and pacifist would have benefited from the room that a two-parter could afford them. More than just the lip service paid here is required in this debate where, though the Doctor has sometimes resorted to violence as a last possible alternative, he would not kill out of anger or revenge even though he understands the desire to do so. So, despite some interesting ideas about nature and nurture, the use of violence and the mythologising of technology, it’s all a sly con just to get us to the big scene where the Doctor can emote over his dead daughter as if she's a long lost relative but, where in actual fact, he has only known her for about half an hour. The series now seems content to constantly rehearse the ‘Last of the Time Lords’ scenario in any which way it can – the departure of companions, the death of the Master - to wring out our emotions but without actually daring to follow through from this timid approach and to properly seize hold of the Time War scenario and give it the pay off it now seriously deserves. If the Song of Ten is coming to an end then can we at least get this ‘wounded soldier of the Time War’ emotional schtick out of the way once and for all? Four years is long enough.